I couldn’t sleep, I’m too excited. So I thought I’d post my Christmas photos after all. We were four – me, my brother, brother’s girlfriend, girlfriend’s brother (got that?). The finished cake. Richard is a true appreciator of Christmas cake. 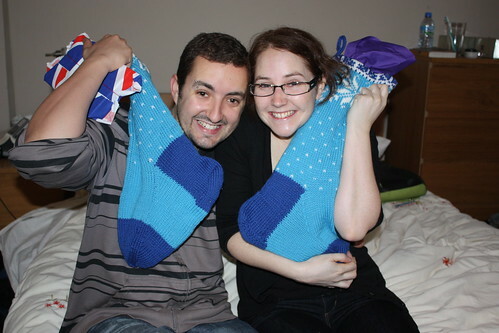 I discovered this the last time we all spent Christmas together, in New York two years ago. I actually lugged a 4 kilo cake with me. So I had to make one this year. It’s amazing how priorities change as you get older. Breakfast came first, then presents. We usually have croissants, but Cameron requested pancakes, and I made some French toast from some leftover brioche loaf as well. I made stockings. Cameron is holding my attempt at wrapping without wrapping paper – I didn’t buy any this year. I had plenty of fabric scraps so I used those to wrap things that needed wrapping. A stocking is already wrapping anyway! 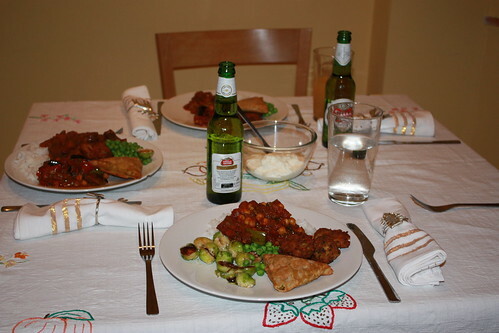 Christmas Dinner was at Richard’s place in Putney. 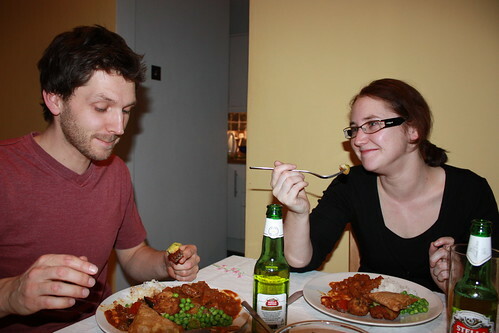 The traditional Jacket Christmas dinner consists of beef curry! No one could tell my why or when this tradition started, but as we’re all good atheists (except for Cam who’s on the fence) I found it delightfully irreverent. I thought a nice vegetarian option would be Allegra McEvedy’s aubergine and tamarind stew, which is in the Leon cookbook or on the Guardian website. It was delicious. Definitely going into the repertoire. Were we all at the kids’ table or all at the adults’ table? 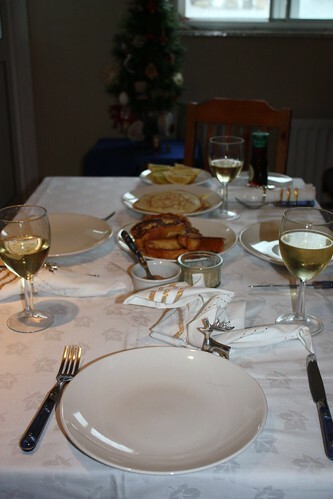 Christmas dinner was surprisingly light on alcohol, as we all overdid it a bit at breakfast…. Richard and Kate contemplating the sprouts. Unfortunately I failed to convert them. Dessert came much, much later (about 11:30 pm) and I forgot to take pictures. Cheese and dessert were my responsibility. Cam is allergic to nuts so I didn’t bother with Christmas pudding. I did chocolate chip bread and butter pudding, which is something my aunt in New York always does (and I think I’ve spent more Christmasses there than anywhere else in the world). 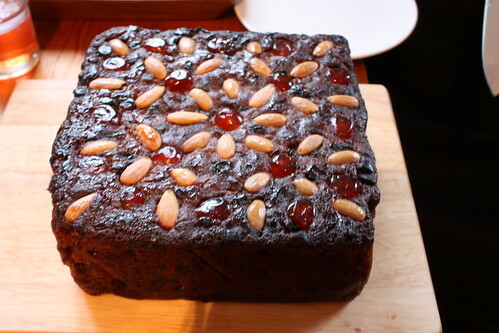 I also did some spiced baked fruit – figs, pears, peaches, nectarines – which everyone loved. It made for a perfect breakfast this morning too. I’m off to Sri Lanka for three weeks! My friend Marissa is getting married and I’m a bridesmaid. I won’t be taking my laptop with me so I don’t think I’ll be posting until I get back. I am taking my camera though, so there will be lots of photos. 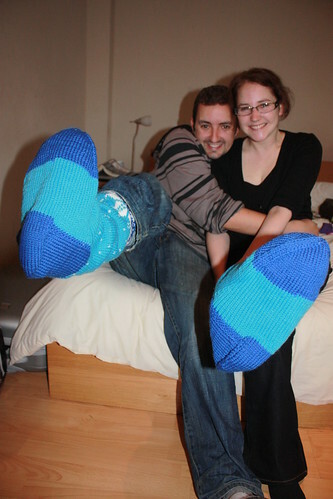 I was going to post a sweet photo of my brother and his girlfriend with their hand knit Christmas stockings, but I already packed my camera so that will have to wait too. I hope you all had a great Christmas yesterday and that you have a happy new year! 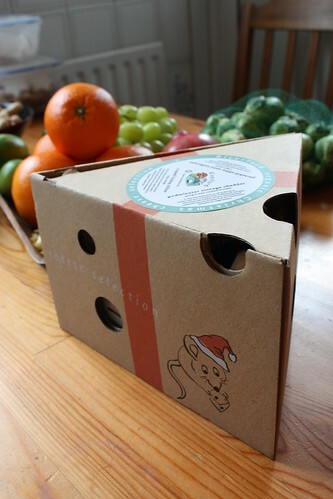 Christmas cheese selection from Riverford. Is this not the most adorable thing ever? I want to tuck in straight away. I didn’t get much else in my order today, just some booze (wine and more sloe gin, couldn’t resist), cream (for pudding), and sprouts because Cameron likes them and now I do too. I’m doing the vegetarian option, cheese and dessert for Christmas dinner. 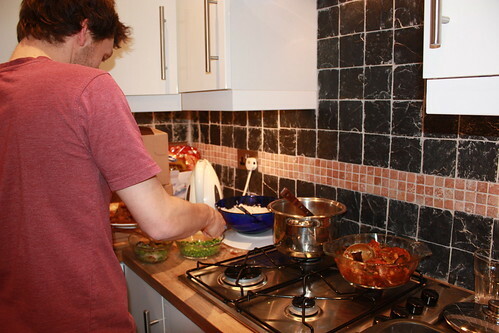 Time to get cooking! There is going to be WAY too much food, but that’s the point, right? My brother and his girlfriend managed to book on to a coach from Paris, and got in at 10 on Monday night (they were due in at 7), only a day and a half after they were supposed to arrive by Eurostar. It’s been really nice showing him around and I’m starting to wish I didn’t have to leave the country on the 27th, as they’ve decided to stay a couple of extra days in London to make up for the time they’ve missed. Oh well, I will be lying on a beach getting over my jetlag. Then… well, stay tuned. 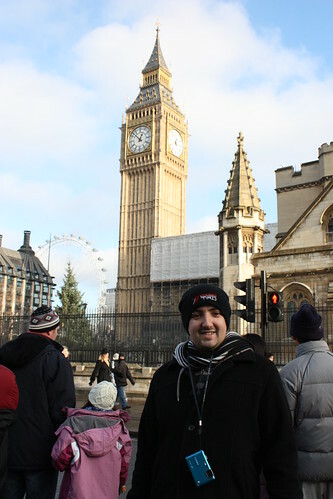 This morning I was meant to be doing a final sweep round the house in preparation for welcoming my brother to the UK for his first trip here in exactly 20 years (he can’t really remember the last trip – on the other hand I think that’s when I decided I was going to live here). I even made his favourite biscuits. However, le mauvais temps in Northern France (what’s French for “the wrong kind of snow”?) has put paid to that plan and I find myself at a loose end. Bad things always come in threes – on Friday my credit card was cloned, on Saturday my brother’s train was cancelled – so now I’m just waiting around for an anvil to fall on my head. Although perhaps there’s already been three – we had a bit of bad luck looking for a new flatmate earlier in the week (yet another blow to NZ-Australian relations – but that’s another story). At the start of the Ottolenghi book, they joke that “if you don’t like lemon or garlic, skip to the end of this book”. This recipe has plenty of both, with four cloves of garlic. Since I’m still fighting off the tail end of my bronchitis or swine flu or whatever it was, I figured I could do with a good dose of garlic. 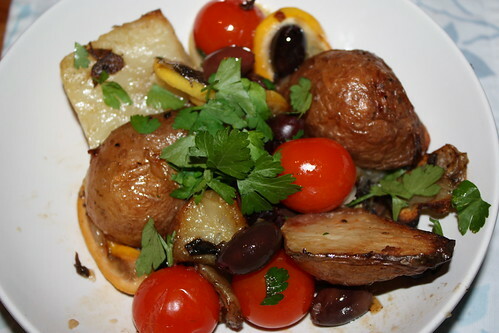 The garlic, lemon, sage, potato, tomato and olive combination is one that would never have occurred to me, but it works really well. The artichokes disintegrated a little, I think next time I would cut them a bit thicker. But all in all it was a colourful, cheering sort of a meal. Comfort eating, only more interesting. Incidentally, no one I know has reported a dud recipe from that book yet. I’ve made the cauliflower fritters about four times now and still love them. It’s possibly my favourite cookbook – barring the Usborne First Cookbook, which was indeed my first cookbook and contains the recipe for the biscuits mentioned above. More on those later. I still have some butter, sugar and flour in the house so I think I will fill the gaping, brother-shaped hole in my Sunday with more biscuits! By the way, does anyone want two tickets to Avenue Q tomorrow? Sigh. I’ve written about Kiva before but it bears repeating. I have been lending through Kiva.org for about a year and a half now, and it’s just amazing to know that my money is really helping people in far-flung parts of the world. In case you don’t know how it works, you go on the Kiva website, where they have a list of people all over the world in need of loans to fund their businesses. You pick one and then decide how much to lend. As the loan is repaid, your money will appear back in your Kiva account and you can lend it to someone else. So the same money ends up helping more and more people. Of course you can put more money into your account and make more loans too. The thing is it’s not charity – these loans are helping people to build up their businesses and provide for their families. And the loans have to be repaid. I tend to lend money to women who are involved in craft-related businesses. Today I lent to a couple of women who do sewing – bedspreads, clothing etc. I really hope it makes a difference to them. If you’re strugging with what to give to the person who has everything this Christmas, or there’s a charity-minded individual on your gift list, consider giving them a Kiva gift voucher. 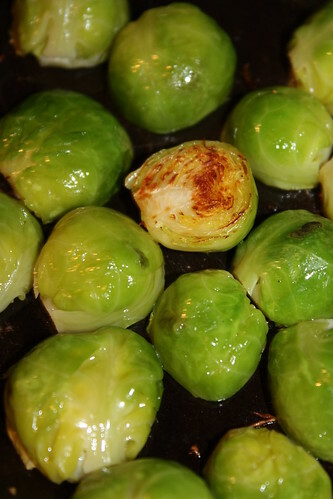 How to make brussels sprouts yummy! When I stopped eating meat fifteen years ago I was still a somewhat fussy adolescent eater and there were quite a lot of vegetables I didn’t like much. I found that I started to like different vegetables more and more, and even broccoli, which I once despised, went to the top of my favourite food list. Whether this was just a part of my tastebuds maturing or whether it was a result of my tastes completely changing as a result of my pescatarianism I’m not sure. However one thing remained on the hate list: sprouts. Fortunately I sat next to Dad at supper so was able to shift them onto his plate, occasionally having to swap them for his carrots (honestly, who hates carrots, but loves sprouts?). I’ve been getting my veg box from Riverford for almost a year now and the one thing I really love about it is that it forces me to eat things I normally wouldn’t touch with a barge pole. Now that sounds a bit strange, but it has really expanded my horizons, and my meal repertoire for that matter. Getting swede three weeks in a row forces you to get creative. 2. 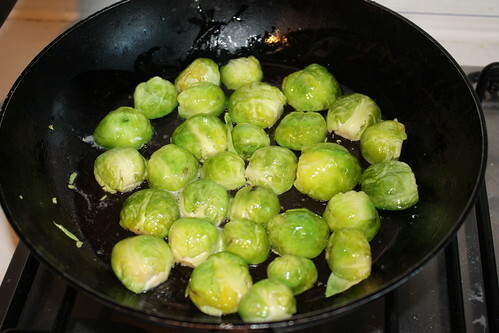 Then place all of your sprouts face down, turn the heat down low and cover with a lid. 3. 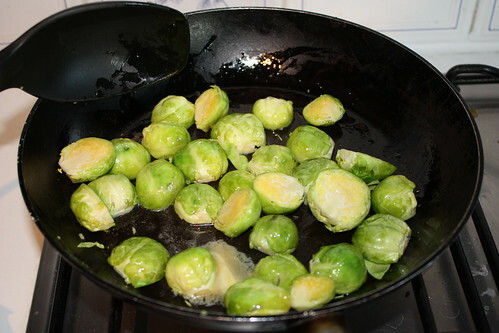 Cook until the sprouts are soft all the way through and a light brown on the underside. 4. 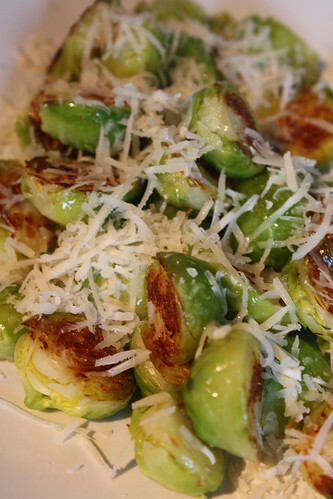 Serve immediately, and sprinkle with some very good Parmesan. 5. Eat. Yum yum YUM. Honest. * the salt is important, Mum. Salt actually takes away bitterness in food.